It was Normie Rowe who first sang this song to me. Well, maybe not to me specifically … he was on the TV singing it. Very small screen, black and white picture, thin sound – but it captured my attention. Maybe it was the girls screaming and through streamers his way. Mind you a few months later, when he did Shakin’ All Over, there seemed to be more girls, more streamers, and louder screams. Anyway, I don’t think it was just the popularity of the song (Top Ten Hit) that made me pay attention back in 1965. It was a combination of things. This song presented an alternative world view to the one we faced in weekly school scripture lessons. A view suited to my contrary nature. I came across this version in Cab Calloway’s 1959 album Hi-De-Hi-De-Ho released by RCA. I had been hunting for a Cab Calloway album that was still reasonably early but did not have the thin sound of the typical 1920’s and 1930’s jazz orchestras – and this was just what I was looking for. 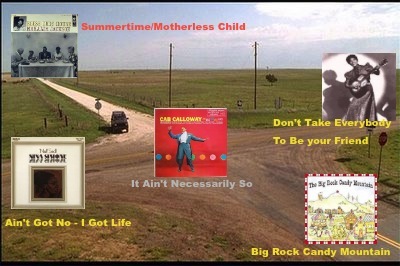 Apart from Cab classics like Minnie the Moocher, The Hi-De-Ho Man, The Jumpin’ Jive and Kickin’ The Gong Around, it has Cab’s versions of some great songs like It Ain’t Necessarily So, Summertime, St James Infirmary, Stormy Weather, and (I’ll Be Glad When You’re Dead) You Rascal You. 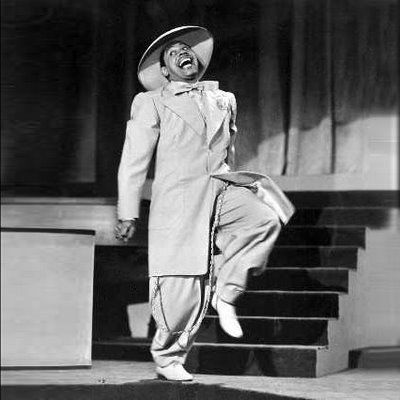 Calloway always claimed that he was the inspiration for the Porgy ‘n’ Bess character Sportin’ Life – it makes sense that his performance of this song would be among the best. But … this version is missing two verses!!! I had not paid any attention to that … that until now. The missing verses are about Moses being found in a stream; and David slaying Goliath. I couldn’t believe it when I listened to the song, so I played it again! And then I took out the CD and played it again. I’m still shaking my head. Cab Calloway of course had a massive resurgence in the 1980’s due to The Blues Brothers film – he was 73 at the time. How are It Ain’t Necessarily So and Summertime/Motherless Child connected? They both form part of the Gershwin/Heyward opera Porgy and Bess … at least that’s the connection with the Summertime part of Mahalia Jackson’s medley. Other Stuff You Might Enjoy. * The Hi-De-Ho Man – a great article from Roger Ebert – Pulitzer Prize winning film critic. * Cab Calloway & Betty Boop – in the early 1930’s three Betty Boop animated cartoons featured Cab Calloway. Max Fleischer – Betty Boop’s creator – had pioneered a technique he patented as Rotoscope. The technique basically enabled animation to be adapted from action film. In these cartoons you’ll see animated characters moving in Cab Calloway style. Each of the cartoons is around 7-8 minutes and they feature Minnie the Moocher; St James Infirmary; and The Old Man of the Mountain. North: Summertime/Motherless Child both left behind. East: Don’t Take Everybody To Be Your Friend by Sister Rosetta Tharpe. I came across this album – Bless This House – rummaging through a pile of records at a garage sale. 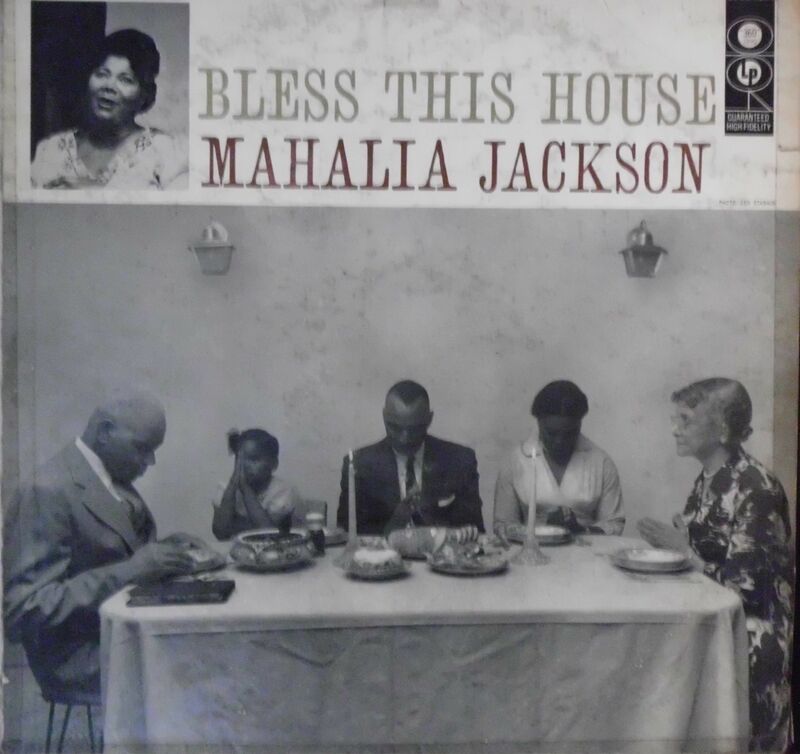 I knew Mahalia Jackson had a great voice but Gospel wasn’t a favoured genre of mine – normally, I would have flicked past it. The album cover got me – a poignant photograph printed on solid board, aged and worn but still sturdy, reinforced at the edges. Inspecting the vinyl, it looked more scratch than track – it made no difference – this (possibly unplayable) old record and its captivating antique cover were always going to be carried away under my arm. It was virtually unplayable … well, it was playable but it was like listening to the crackle of static electricity. Mahalia Jackson and the Falls-Jones Enesemble played through that static – with grace, power and beauty. And they did that regularly for ten years or so. For ten years or so, every visit to a record shop, garage sale, market or jumble sale, I was alert, my eyes peeled for another copy in better condition. Eventually, I found it – the cover design had changed, the vinyl almost pristine – at last the scratchy veil was lifted on the amazing piano of Mildred Falls and the searing voice of Mahalia. Summertime/Motherless Child & Piece of My Heart – What’s the link? Summertime has been recorded over 25,000 times, so I guess the fact that Mahalia Jackson and Janis Joplin are in that long list makes for a pretty weak link … but it is a link. Perhaps made slightly closer by the fact Summertime is the track before Piece of My Heart on Cheap Thrills. The fact that Mahalia sang Summertime at all was pretty amazing considering that she rarely sang anything secular. I spent hours sourcing images to accompany the version of the song (from Bless This House) on a video I was going to upload to YouTube, so you could have a listen. The copyright owners have it blocked. So, you’ll have to make do with this performance. It’s still good – but not a patch on the Bless This House version. * Just Mahalia, Baby! – an article celebrating Mahalia’s 100th birthday. It contains biographical detail, a number of videos and an interesting account of Mahalia’s appearance on the NBC’s Dinah Shore Chevy Show in 1958. * Mahalia & Dinah Shore on the Dinah Shore Chevy Show singing Down By The Riverside. At May 1st 2011 at 00:01 GMT we know of at least 41,915 public performance [of Summertime], of which 33,345 have been recorded. Of these we have 25,998 full recordings in our collection. * Summertime on Shmoop – Shmoop is an education website and it contains some great stuff. * Sometimes I Feel Like A Motherless Child performed by Bobby Breen in the 1939 movie Way Down South. * Playlist of 9 (YouTube) – Sometimes I Feel Like A Motherless Child includes versions by Paul Robeson, Odetta, Van Morrison, Marilyn Horne, Charlie Haden & Hank Jones, Marion Anderson. 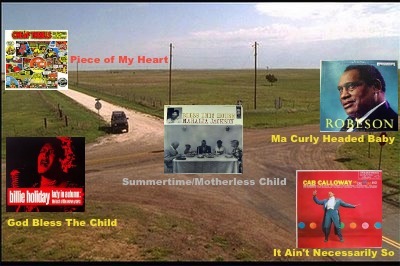 * Playlist (YouTube) of 16 – Summertime includes Billie Holiday, Miles Davis Ray Charles & Cleo Laine, Ella Fitzgerald, Ella Fistgerald & Louis Armstrong, Keith Jarrett, Same Cooke, Leontyne Price, The Zombies, Angelique Kidjo. And the next road takes us to? North: Piece of My Heart has already been taken. East: Ma Curly Headed Baby by Paul Robeson.